You might have just moved into your new house. Or you’ve finally decided to do a makeover in the living room. Or you’re doing a spring cleaning and want to dust behind your bookcase: there are plenty of reasons to get your books off their shelves. And that’s how you create options. There are several ways to organise your books for optimal use, although I have come to notice that these systems usually only make sense to the owner. The same probably counts for me as well, but that’s no reason to give you plenty of ideas for your own bookcase. Probably the most straightforward way for organising books. You can sort by the last name of the author, or if you feel adventurous or don’t care for author’s names, you can sort by title. Libraries usually sort by author for fiction, and ignore initials and the first part of a surname if it contains several parts. George R. R. Martin => Martin, George R. R.
If the books are sorted by title as well, the words ‘the’ and ‘a’ are ignored. Also pretty obvious. You can sort your books by genre (thriller, fantasy, sci fi, romance, detective, adventure, fairy-tale, etc.) and then put each on a separate shelf or, if you like a lot of different genres and your bookcase isn’t that big, you can leave a little room between two genres with vases or witty bookends. Or a jar with bookmarks. -You can sort them by date you bought the books. This has the advantage that you never have to squeeze that new romance on a shelf that’s already overflowing, whilst the one at the top is still nearly empty. The disadvantage is of course that it’s tough to find an old book back. -You can sort them by the year they were written. If you like books from several different time periods, this can be a nice option, and it makes sure your Dante Alighieri isn’t next to your Douglas Adams. This might require some time on Wikipedia to look up all the dates. I see these pictures daily on Pinterest and it makes me want to rant. I mean how do people get all these colours? I don’t know about you guys, but most of my books are black. 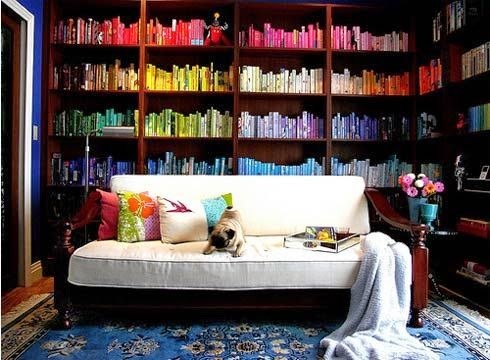 Do they buy books for the colour instead of for the story? Why would you do such a thing? This one has less categories than if you’d sort by genre (unless your taste in books is quite narrow) and can also be organised with knickknacks between the books to differentiate the books you’ve already read from those you still need to read. Sometimes you can get a deal on a whole box of Wordsworth books, or you can buy ten books by French authors who don’t have much in common but they have pretty matching covers. If you have an eye for these series, you might want to sort by publisher. It also comes in handy for series of encyclopaedia about broad subjects, so you don’t have to put the one about technology on a different shelf than the one about mammals. Beware, here be the fanatic librarians. The Dewey Decimal System gives a number to each subject – Mister Dewey ordered nine subjects according to how important he thought they were. This system only works for non-fiction. this can cause some confusion, because if you have a book about the anatomy of the horse the number will be somewhere in the 574-point-something-something, but if you have a book about caring for horses you’re way off the mark and you will probably have number 636-point-something-something. A book about Alzheimer could be in the 100 category or 500 category: it all takes quite some research and familiarisation with the Dewey system. I would only recommend this one if you have help, seas of time and if it’s truly necessary because you have more than twenty bookcases of non-fiction. I must add that fairly recently (compared to the ancient Dewey System), there is an uprise in libraries of a new system for non-fiction, which uses colours and pictures and is all in all much easier. I don’t know the name of the term in English, but the translation would be “Searching Without Effort”. In this system Alzheimer would be found on the bookcase with a pink symbol of a heart, and then under the category Dementia. Bish bash bosh – easy peasy. If your partner isn’t such an avid fan of reading, or if on the contrary he/she thinks Tolstoy is an easy read, or if you have a set of little readers, you might want to try this one. This way you could literally read your way ‘up the bookcase’ as you get better at reading. I would not put the saucy novels too far down if you do have some kids around though. That one might be a whole new bookcase altogether. Of course, you can just make your own blend of all these (a genre mocha with a dab of publisher with a whip of To Read? An alphabetical latte with chronological sprinkles?). Hi! Welcome to my blog. You can call me Bejoes. I'm a total Tolkien geek, but I'm also a fanatical reader in general. I like collecting Bowie vinyls, yellow teapots and shiny rocks. I also never know how to write vinyl without writing it wrong first.